The Canon PowerShot SX610 HS is the latest basic point-n-shoot model from Canon, but there just isn't much in this camera that will make you take notice of it. The SX610 offers 20.2-megapixels of resolution, but its image quality simply isn't where it should be for a camera with that much resolution and an MSRP of $249. Even under nearly perfect lighting conditions, the PowerShot SX610's image quality isn't good enough to make mid-to-large-sized prints. This model has no manual control features. Burst modes have poor performance with the SX610, although its shutter lag performance in good lighting conditions is above average. The camera slows significantly when you're using the flash. The camera does offer an 18x optical zoom, which is pretty good for a camera that measures 1.05 inches in thickness, but that's not enough to make the Canon PowerShot SX610 a highly recommended model. Read more in our Full Conclusion. The Canon PowerShot SX610 HS updates last year's SX600 with the addition of active NFC (Near Field Communication), a new higher resolution LCD display, and a new 20.2 megapixel "High Sensitivity" image sensor. The 18x optical zoom lens remains, as do the 3.0-inch LCD display's dimensions, but this is a pretty far-reaching telephoto lens for a pocket-sized camera. The SX610 also includes Auto Zoom mode, which automatically frames a subject by zooming in to produce a pleasing composition within a perfectly focused image. Lastly, like many of the new Canon models, the SX610 HS features NFC and, similar to last year's model, built-in Wi-Fi to allow you to connect this camera to compatible smartphone and tablet devices to either back up images and videos, share them on social media, or to even remotely access certain camera menus. 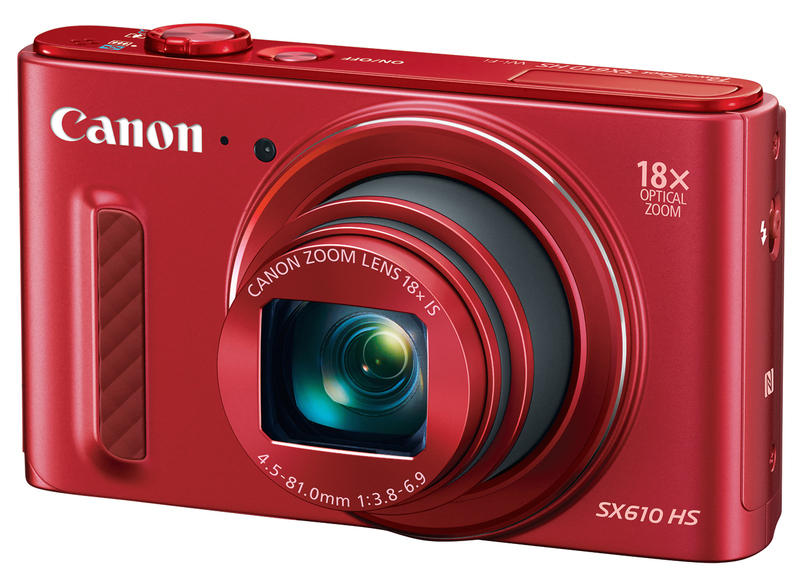 The Canon PowerShot SX610 HS is available in White, Black, or Red, with a $249.99 MSRP. See our best price box at the top right of this page to see current online pricing.